The Upton Police Department is advising residents to take precautions to avoid conflicts with animals after a bear was sighted on North Street near Westboro Road. Here are some additional tips from mass.gov about living with black bears. Despite popular belief, black bears are usually wary of people. In woodland areas, bears may disappear long before they are seen by people. Sometimes, a bear may not immediately recognize you as a human and may be curious until it scents you. Make the animal aware of you by clapping, talking, or making other sounds. Do not approach bears. Do not intrude between a female bear and her cubs. Keep dogs restrained and stay a respectful distance away while enjoying this fascinating animal. Do NOT Feed Bears — Keep the “wild” in “wildlife”. Bears which become accustomed to humans and dependent on human-associated foods are likely to cause property damage and become a nuisance. Sometimes it places the bear in jeopardy of being destroyed because it is no longer afraid of people. Take down birdfeeders before April 1 and put them back up in late November or early December. In mild winters, some bears may be active year-round. Do not leave pet food outside at any time of year. Secure Trash in Closed Containers in a Garage or Other Outbuilding —Put trash barrels out the morning of trash pick up, not the previous evening. Businesses and campgrounds in bear country should consider using bear-proof dumpsters. Beekeepers — Use temporary or permanent electric fences to safeguard hives. Electric fences are most effective when put up before the first damage occurs. Protect Orchards and Crops — Temporary electric fencing may be used to protect corn and other crops. Seven-strand slanted nonelectric fences have been used to keep bears out of orchards. 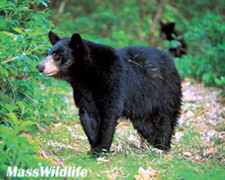 Contact local bear hunters for the early September bear season to hunt the fields. Protect Livestock — Whenever possible, pen livestock in or near the barn at night, especially pregnant females and those with Photos © by Bill Byrne Photos © by Bill Byrne small young. Avoid field birthing if possible. Do not leave carcasses of dead animals exposed in fields, pastures, or nearby areas. Consider the use of guard animals if you have a large or valuable livestock operation. Bears are important and valuable mammals in Massachusetts. They are classified as big game mammals for which regulated hunting seasons and management programs have been established. If you are experiencing problems with bears or have any questions regarding them, contact your nearest MassWildlife District Office, listed below. Reblogged this on Greater Grafton. Does anyone know where on North St?